The U.S. Commerce Department has backed Boeing in its challenge to Bombardier, recommending an enormous tariff on sales of the Canadian firm's C Series jetliner. The initial ruling by the International Trade Administration, an arm of the Commerce Department, recommends a 219.63% tariff on the delivery of each airliner. Boeing (BA), America's largest exporter and sole producer of commercial airliners, is suing Bombardier. At issue is whether the plane maker received financial backing from the Canadian government that allowed it to stay afloat and sell to Delta for what Boeing alleges were "absurdly low prices." "The U.S. values its relationships with Canada, but even our closest allies must play by the rules," said Commerce Secretary Wilbur Ross in a statement. "The subsidization of goods by foreign governments is something that the Trump Administration takes very seriously, and we will continue to evaluate and verify the accuracy of this preliminary determination." The ruling announced Tuesday is the first of two in the case. The second is expected on as early as Oct. 5 and may add even more to Bombardier's tariff penalty. A final determination by the Commerce Department is expected in 2018. The dispute stems from a 2016 Delta Air Lines order from the Montreal-based air and rail giant for as many as 125 C Series aircraft. 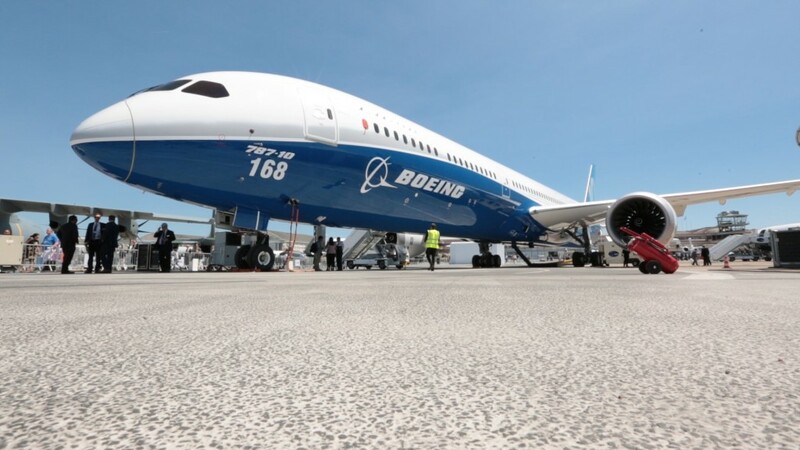 Boeing alleges government support helped its Canadian rival establish the all-new airliner at the expense of Boeing's own 737 jets. Boeing claims that Bombardier is selling each C Series jet to Delta for $19.6 million. That's not accurate, said Delta, which disclosed its actual purchase price as part of the investigation. The jet's list price is nearly $80 million, but steep discounts are common. Boeing had recommended a heavy tariff on the C Series, paid by Delta or any U.S. airline importing the aircraft in what would be considered a major blow to Bombardier and its ability to establish the new jet in the world's largest aviation market. The preliminary decision by the trade commission for a 219.63% tariff was steeper than the 160% recommended by Boeing. Bombardier reacted to the decision, saying: "We strongly disagree with the Commerce Department's preliminary decision. The magnitude of the proposed duty is absurd and divorced from the reality about the financing of multi-billion dollar aircraft programs." The Canadian transportation giant's shares were hard hit Wednesday, closing down nearly 7.5% after rebounding from a nearly 14% plummet at the opening of trading. Boeing in a statement hailed the result, saying, "This dispute has nothing to do with limiting innovation or competition, which we welcome. Rather, it has everything to do with maintaining a level playing field and ensuring that aerospace companies abide by trade agreements." The dispute has drawn in the leaders of Canada and the United Kingdom and now threatens to shoot down a $5.2 billion Boeing F/A-18 Super Hornet fighter deal with the Royal Canadian Air Force if the case isn't dropped or settled. "We won't do business with a company that's busy trying to sue us and put our aerospace workers out of business," Canadian Prime Minister Justin Trudeau said earlier this month. Bombardier's aerospace division employs 28,500 worldwide, including 4,000 in Northern Ireland where the jet's wings are manufactured. Chrystia Freeland, Canada's Foreign Affairs Minister, said: "While this is only a preliminary stage in the investigation, and no duties can be imposed until the final investigations are completed, Canada strongly disagrees with the anti-dumping and countervailing duty investigations into imports of Canadian large civil aircraft. This is clearly aimed at eliminating Bombardier's C Series aircraft from the U.S. market." British Prime Minister Theresa May had also sought to intervene in the dispute, asking President Trump to help protect jobs in Northesrn Ireland. "Bitterly disappointed by initial Bombardier ruling," May tweeted on Wednesday. "The government will continue to work with the company to protect vital jobs for Northern Ireland." The Canadian government said the complaint was just as likely to threaten U.S. jobs as those in Canada and Northern Ireland. Freeland said the C Series jet supports an estimated 23,000 jobs in the U.S, including those in Connecticut, Florida, New Jersey, Washington, New York, Ohio, Kansas, Pennsylvania and Colorado. The jet's advanced engines are manufactured in the U.S. by Pratt & Whitney, a unit of United Technologies, which supplies many parts of the jet. As a result, Bombardier had drawn the public support of members of Congress and elected officials and even U.S. airlines like JetBlue Airways and Spirit Airlines who wanted to expand the range of options for commercial airliners beyond Boeing and its European rival Airbus. The steep tariff, which is far in excess of the 160% Boeing had requested, amounts to making Delta pay the roughly $5.6 billion list price for the 75 jets it has on firm order. In the airline industry, commercial buyers do not pay list price and typically command steep discounts of 40% to 60%. 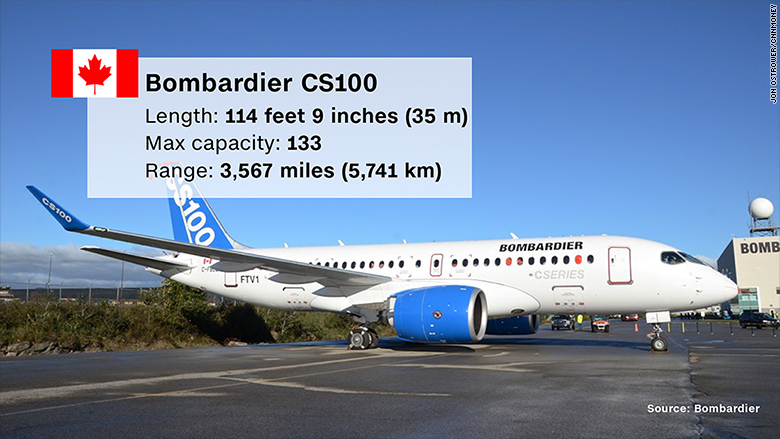 Each CS100 jet has a list price of nearly $80 million. Bombardier also maintains that the smallest single-aisle 737 does not compete with the CS100, the roughly 110-seat Bombardier model purchased by Delta. During the 2016 competition, Boeing offered Delta, the second largest U.S. airline, used jets from another manufacturer. Delta (DAL), which will use the jet on short and medium range flights around the U.S., cautioned that the ITC's decision was preliminary. "We are confident the USITC will conclude that no U.S. manufacturer is at risk because neither Boeing nor any other U.S. manufacturer makes any 100-110 seat aircraft that competes with the CS100."